Now that the holidays are over, I’m back full swing working on new, delicious and of course healthy recipes to enjoy. I’m a huge fan of sushi but between the sugar they use (yes its tons and that’s why it tastes good) and the rice, its hard to figure out what to eat. So I came up with a delicious alternative. You can cook your tuna steak to your desired level of “doneness”, I love it really raw but feel free to cook it thru! In a large bowl put the cabbage. Then add splenda, sesame oil, 2 tsp low sodium soy sauce, some of the salt and pepper and 1 Tbsp rice wine vinegar. Toss it and allow it to sit for at leat 20 minutes but the longer the better. (The longer it sits the more it shrinks but the better the flavors combine in to the cabbage). On a plate place the tuna steak and top with the remaining vinegar, soy sauce and salt and pepper. let it sit for 10-15 minutes and keep tossing in the sauces. Then place a pan on the stove top on high heat, when the pan is smoking, place the fish inside. I grill for 1 min on each side (or until i start to see the white)If you like it cooked through, keep it on longer. 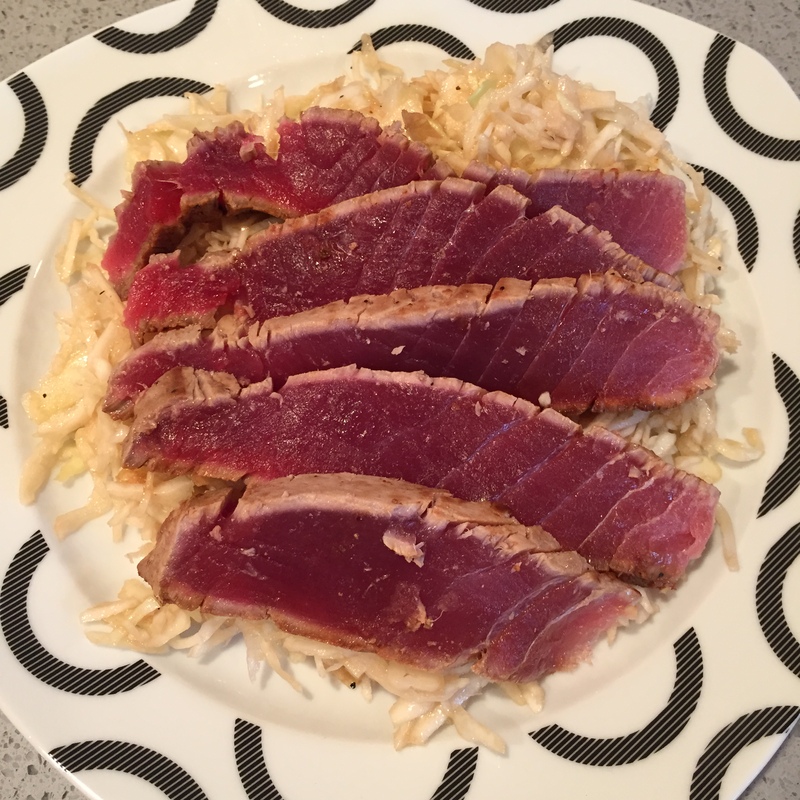 Split the slaw in half and then slice the tuna and split between 2 plates.